As far back as I can remember, my Dad was a Studebaker fan. For many years there was either a Lowboy or two in the driveway, and my mother's baby-blue 1956 Champion. 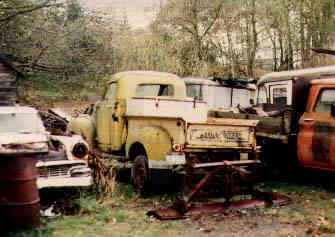 I found my first Studebaker, a beautifully original 1955 Champion, on a used-car lot in Burnaby, British Columbia, in 1975. After several days of negotiation, I got it for $400. It was a wonderful car, and Studebakers soon became an obsession. I ended up with 13 of them - pickups, Larks, Hawks and the original "Lowboy". At various times through the late 1970s and early '80s, I served as the Treasurer, Secretary, Newsletter Editor, Events Chairman and President of the BC Coastal Chapter (British Columbia) of the Studebaker Drivers' Club. I've never met a more passionate group of men and women than at Studebaker functions - I wish we had a chapter in the Yukon! I'm still fascinated by the marque - always ahead of the rest of the industry, Studebaker just couldn't attract a wide audience, even though their customers were the most brand-loyal in the industry. In Alaska and the Yukon, the contribution of Studebaker's 2 ½-ton 6x6 trucks is beyond calculation - thousands of them were in use on projects including both the Alaska Highway and Canol Pipeline. I also have a page of Studebaker miniatures - both ones in my collection, and ones I don't have. Studebaker fan trivia - "Stude" is pronounced as 'stew-dee', not 'stewed'. 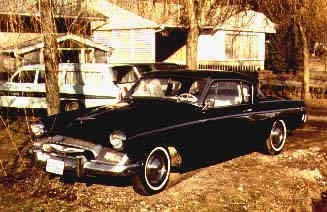 My first Studebaker was identical to 3 that my father had - a 1955 2-door Champion, usually called a "Lowboy". 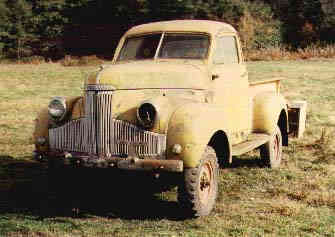 A 4-wheel-drive 1947 Studebaker M-Series pickup, as I found it in 1977, behind a service station in Aldergrove, British Columbia. The 4x4 comes home with me, in November 1977. The 4x4 sitting in front of my house in Newton.